Imagine an elevator that goes up and down at the same time, teleporting you to insane sonic dimensions. That’s what the POG does, as it lets you drop your instrument by an octave, or raise it one or two octaves—all at the same time. And early pitch change programs in rack units, such as the ART Multiverb and Yamaha’s SPX 50D, could help you simulate a 12-string guitar by going up an octave. But they tended to sound stiff—especially the ART. Its brittle high end was better suited for an elf-cartoon soundtrack than, say, copping Roger McGuinn’s jangle. Joe Satriani, Nick Zinner (Yeah Yeah Yeahs) and multi-instrumental wizard Jon Brion rank among the many prominent players who love the POG, which in recent years gave way to the ultra-compact POG2, and its baby brother, the MICRO POG. Here we take a spin through the POG’s pitch-change funhouse. Sliders: Eight sliders control input, dry out, sub octave, +1 octave, +1 octave detuned, +2 octaves, +2 octaves detuned, and low pass filter. Other features: a single three-way switch controls three additional low-pass filter modes. Single footswitch controls effect on-off. Why you’ll love it: These original POGs are getting harder (but not impossible) to come by, selling for about $300 and up in very good condition. They come in the same distinct, rectangular steel housings as other vintage EH pedals, such as the Memory Man (delay) and Q-Tron Plus (envelope filter). 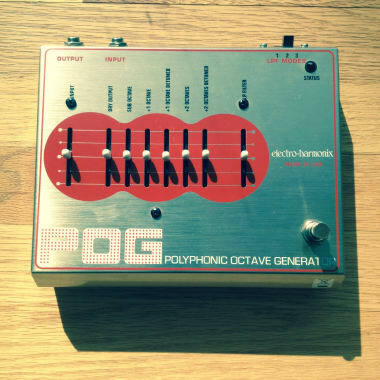 Simply put, the POG sounds amazing: It tracks your guitar in simultaneous octaves with punch and character. And it’s equally easy to dial in sounds that are classic (bass guitar, 12-string) or fantastical. Imagine your guitar as an organ, for example, or an intergalactic launcher of photon torpedo doom. Other features: Three buttons control dry effects (how signal responds to attack, LP filter and detune); Q for the LP filter; and programming of presets. Two footswitches control of-off and desired preset. 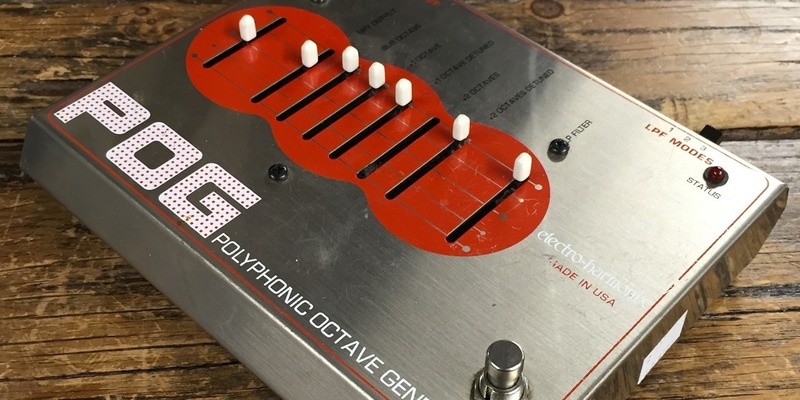 Why you’ll love it: The POG2 takes up about one-third less pedal board real estate than the original and also has a new, terrific feature that lets you store eight of your favorite sounds, then access them though the preset switch on the lower left of the unit. It also lets you mix in two lower octaves—double the thump. There’s some debate in chat rooms as to whether the POG2 loses some of the POG’s mojo, and certainly the sliders on the original feel just a bit tighter. And the detune slider on the new POG2 works on both upper octaves simultaneously instead of independently. But the POG2’s overall construction is still rugged—those sliders are metal now, not plastic—and many users argue that it sounds better. Certainly, it offers more sonic options: Having those presets will save lots of time (and turn lots of heads) at live shows. Other features: Separate Dry and Effect outputs. Single footswitch controls effect on-off. Why you’ll love it: If the POG2’s price tag is just a bit steep for you, and you value simplicity in your rig, then the MICRO POG could be your pitch-change charm. While certainly less versatile, the sound offers no compromise and the MICRO POG can handle at least a few of your ever-changing moods. (Octave up? Octave down? Or both?) It also has at least one cool feature the POG2 lacks: two outputs that let you split the signal between different amps. So go ahead, play the guitar sound through your guitar amp, the bass sound through a bass amp, and impress your friends like you’re a Micro Jon Brion. For some players, older pedals on their way to becoming vintage will always cast a heady spell—and certainly the original POG’s mystique is understandable. But hats off to the POG2 as it builds on the POG’s foundation and then some. 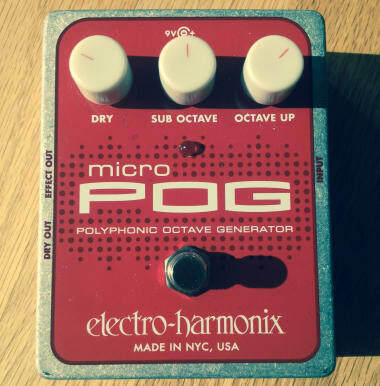 From its compact size to its bonehead-simple preset programming, the POG2 has many key advantages for the gigging musician that the original can’t touch. 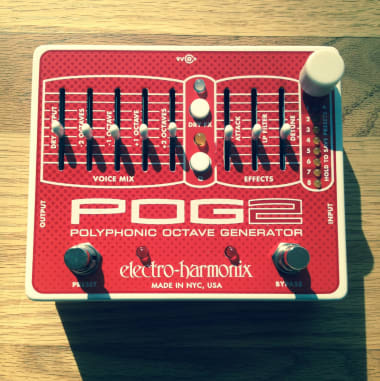 If you’re experimental and restlessly seeking new sonic frontiers, the POG2 (especially in combination with delay and modulation pedals) could keep you experimenting for days. But for those players who believe in the power of limited options, the MICRO POG gives you pitch change you can dial up in seconds, at a price you can more easily afford.